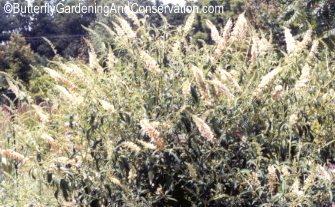 Butterfly Bush is likely the best nectar source for butterflies! It comes in many colors and commercial varieties. Royal Red, Black Knight, Profusion White, Pink Delight, Alba, Claret Purple/lle de France and Nanho Purple are some of the better known varieties. Needs well drained soil. In colder areas it will die back to the ground in the winter. Can be pruned back each spring after the last freeze to keep it a smaller size. Deadheading the dead flower spikes throughout the blooming season will encourage more blooms. Even though butterfly bushes are not native to my area (North American, midwest) they are such a great nectar source that I have a few growing in my garden. I do try to grow mostly plants native to this area - but butterfly bushes are one of the major exceptions I make to that rule! 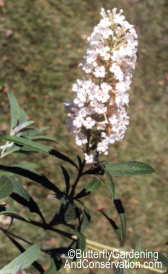 Butterfly Bushes can be bought from pretty much any local nursery. Their selection of varieties may be limited though. Nature Hills Nursery is a good online source for ordering. Or if you don't want to order from their site you can request a plant and seed catalog that they will mail out to you. 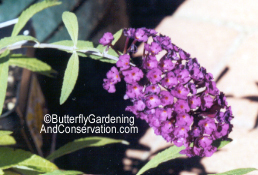 You will probably find many local nurseries that also sell butterfly bushes, but many times they are pretty limited in the varieties they offer. New ones can be started from cuttings somewhat easily. Butterfly Bushes are part of the Loganiaceae Family of herbs, shrubs and trees characterized by their flowers clustered in spikes. 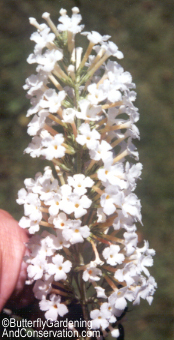 Close up of Profusion White flowers. Close up of Royal Red flowers. Profusion White Butterfly Bush from a distance.